V Pravalika (7th STD) hails from Mallapur Village, Ranga Reddy District. 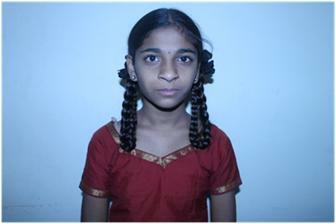 She is studying at Sri Sai Model High School, Cherlapally. Her mother Manjula expired due to ill health. Her father is working in a petrol station. When it became difficult for her father to look after her and support her education he contacted Sphoorti foundation. She is good at studies.